We finally got to leave the hospital around 7pm yesterday after we took our car seat safety class/test at 5pm. Good thing we took the class because we were going to do everything wrong (really babies-r-us shouldn’t sell all the extra things like pads for the shoulder straps, comfy headrests, mirrors to put on seats to see the baby, etc… because they all void the warranty of the car seat and things like the mirror go from functional to dangerous projectiles in a wreck). But then it was time, the trip home was upon us! On the way out we decided to stop at the winter wonderland and get a family photo. The first photo was a little shaky and I made the lady take another, is that bad or just the photographer in me? 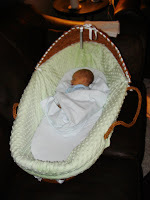 Now that the car seat had been tested it was time to put it to action! Jackson seemed pretty comfy and we made it the entire way without a peep of discomfort. The entire time Jackson was in a hospital he was on a pretty regular, but that would all change. We got him home and he was wide awake…all night…morning…day…and finally decided to take a nap around 4pm. In an attempt to get him to sleep last night we tried just about every bed, seat, swing and flat surface we had. Nothing worked except laying on mom. So that’s were he remained. 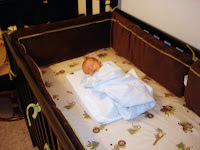 But tonight he gets to stay in the crib, probably…maybe…I’m not promising anything. Sorry for the long gap between updates, but I guess having nothing really to update is a good thing. Jackson is doing great! The doctors seem very optimistic that he’ll be home Monday or Tuesday!!! After the initial night of his A’s and B’s he hasn’t had anymore episodes. The doctors told us that sometimes premees just kinda forget to breath but that Jackson seems to be remembering. Just as we began to kinda see the end, last night happens. The report from the doctors earlier in the day was that Jackson was doing great. Then last night when we were there with him he kept having what they call “A’s and B’s”. ‘A’ for apnea and ‘B’ for bradycardia. Apnea: is a technical term for suspension of external breathing. During apnea there is no movement of the muscles of respiration and the volume of the lungs initially remains unchanged. Bradycardia: as applied to adults, is defined as a resting heart rate of under 60 beats per minute, though it is seldom symptomatic until the rate drops below 50 beat/min. In Jackson’s case, the term is used to explain a heart rate that, while not technically below 60 beats per minute, is considered too slow for the individual’s current medical condition. And is more than likely being brought on by the apnea. Normally Jackson’s heart rate is about 120-130bpm but when he would have a brady his rate would drop to 60bpm. It was a pretty scary night for us, we know that it is fairly common in preterm babies but we were just getting so close to him coming home. On an up note, he no longer has the feeding tube in and, besides the leads checking his vitals, he’s tube free! Keep praying!